First up, get your mock up files, photoshop layout, bootstrap template, or whatever. Then decide on a name for your package which we’ll use for the whole project. I’m making a fashion store magento site for the purposes of learning, so i got a theme from http://w3layouts.com/, and I’ll be calling my theme ‘fashion‘. Once you have your html template ready, we start creating our folders. Now we have the directory structure in place, we need to create the required files. The easiest way to do this is to copy the files from the base theme, and edit them to suit. Lastly, copy the 3 css files in /skin/frontend/default/css/ into /skin/frontend/fashion/default/css. styles.css is the main stylesheet, print.css is the style for printed materials, styles-ie.css is the style for that popular ‘browser selection tool’ 😉 . Disable the cache. 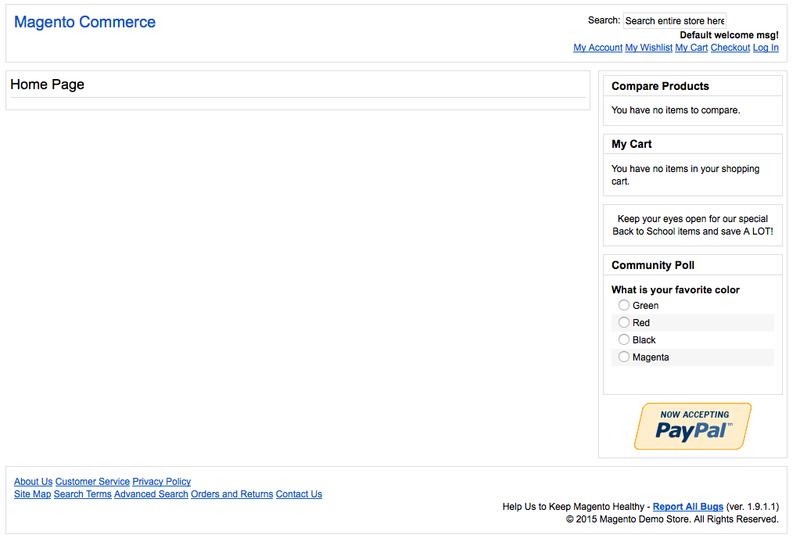 To do this, navigate to /admin in the browser and log in to your Magento control panel. Once there, go to System > Cache Management . Click select all, choose Disable in the Actions select element, and click submit. Now we can activate our theme! Click on System > Configuration > General >Design and click on the package option. Type in your package name (in my case fashion), and click Save Config. It’s a good idea to disable the WYSIWYG editor for the CMS section, as your HTML will be tinkered with. It’s meant for non-techie-types, so lets turn that off. Go to System > Configuration > Content Management, select Disable Completely, and again save your config. Lastly, pages can be made out of bits from other pages. Sometimes, it can be awkward finding the file you need if there are several blocks in a page. There is a helper for this which displays the template path. Go to System > Configuration > Advanced > Developer. Above the left hand column, you will see Current Configuration Scope. Select Main Website. In the Debug section to the right, select Yes to Template path hints. Save. Have fun setting up your own themes! I’ll be blogging more as I learn more, so stay tuned! The default transactional email templates are stored in app/locale/en_US/template/email/. You can edit these files directly, but I wouldn’t recommend it. The better way to do this is to override these templates, there are two ways of doing so. 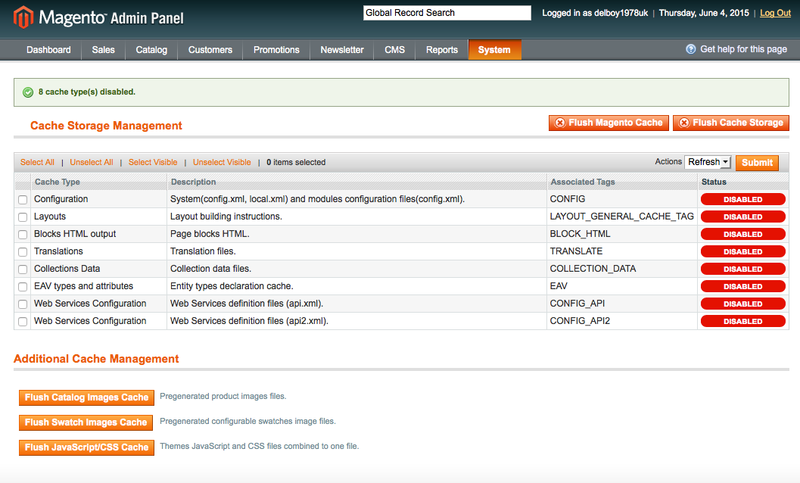 First way: you can copy the app/locale/en_US/template/email/ into app/locale/en_GB/template/email/ the Magento Admin Panel. Doing so (this is providing your site is GB) means that the GB files will override the US ones. It also means you can have completely different templates for each locale. However, you can alter each locales template through the admin panel too, and instead of using files, it pulls the override templates from the database. To do this, log in to the Admin section, and go to System -> Transactional Emails. Click on add new template. Select one of the existing templates, and select the locale you wish to work with. Then click Load Template. The code will appear below. Give the new template a name, and start editing it! When you hit save, it goes into the DB. If you look you will see that the template file han’t been altered.